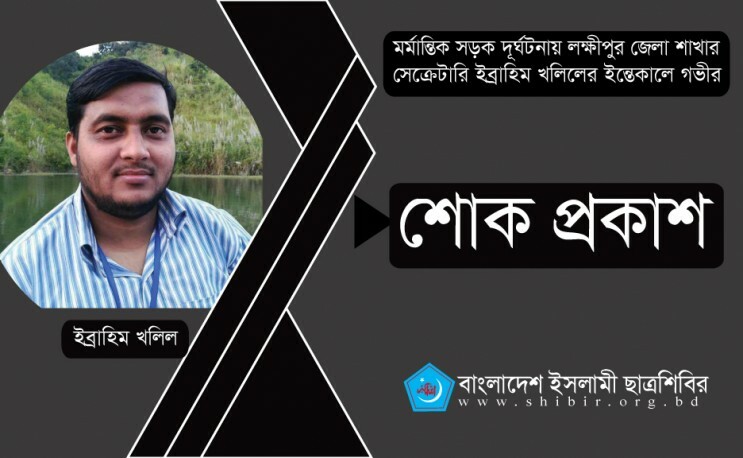 Bangladesh Islami Chhatra Shibir has expressed deep shock at the death of Secretary of Lakhsmipur District unit Ibrahim Khalil in a tragic road accident. In a joint condolence message, Chhatra Shibir central president Yasin Arafat and secretary general Mobarak Hossain said that he was injured in a road accident when he was riding a motorcycle to the masjid to lead Jumma prayers. After being taken to hospital, he passed away (Inalillahi wa Inna Ilaihi Razioun). We are deeply shocked at his demise. In his death, the organization lost a dedicated soul and effective leader. His sacrifices and efforts to further the cause of the Islamic student movement will remain an example to emulate for us. We pray for Allah's forgiveness for the soul of Ibrahim Khalil and extend our deep sympathies to the bereaved family members.